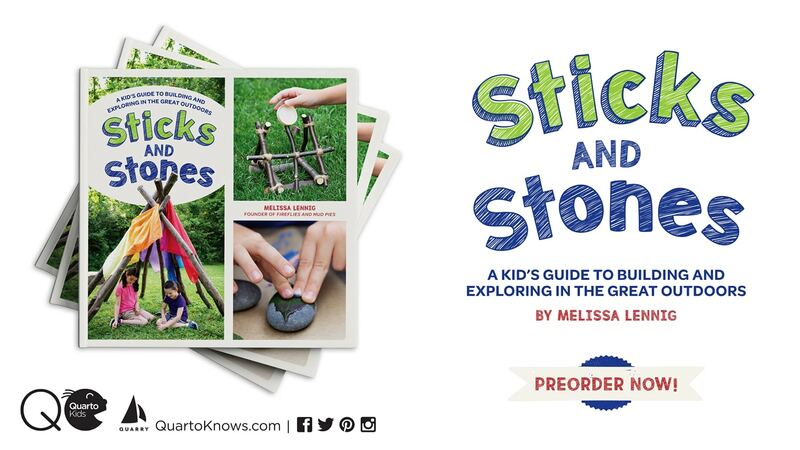 By Melissa Lennig on January 10, 2015 14 Comments. This content contains affiliate links. As an Amazon Associate I earn from qualifying purchases. 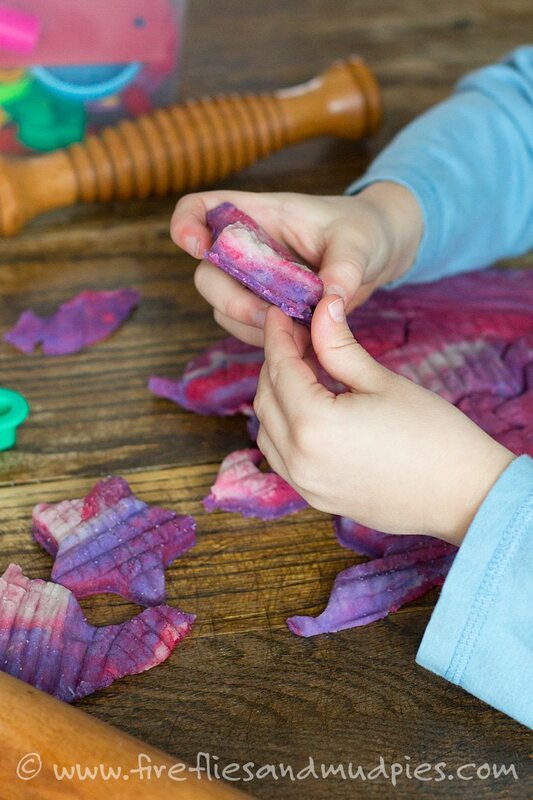 Playdough is an adaptable, open-ended, and inexpensive sensory experience. It’s fun and easy to delight your children by preparing a fresh batch for any occasion or holiday. 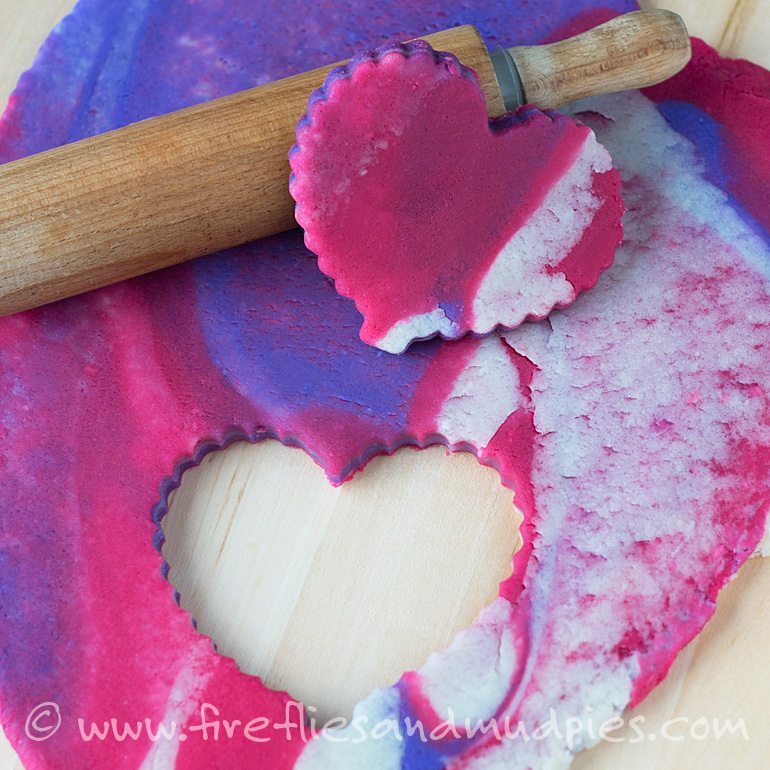 Shared below is a recipe for Marbled Valentine’s Day Playdough. It’s bright, soft, and only takes 5 minutes to make. I love the colors of this playdough! It reminds me of the bicycle I rode in elementary school—a purple and pink Huffy! Whisk 1 cup water, 1 cup flour, ½ cup salt, 1 tbsp oil, 1 tsp Cream of Tartar, and several drops of purple or pink dye in a saucepan. Heat the dough mixture until it forms a ball. Remove from the pan and knead well. Repeat 2 more times to make the other colors (for white, leave out the food dye). 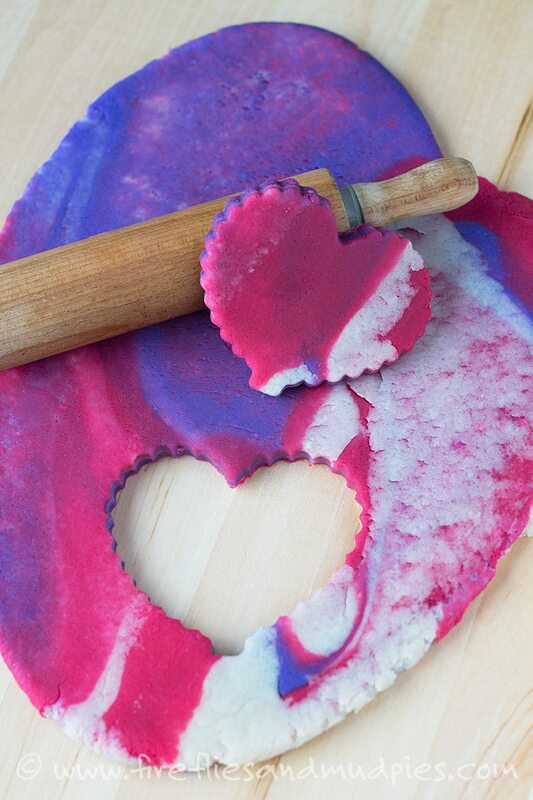 Twist the playdoughs together and roll into a ball to create a marbled effect! The textured rolling pins are the best part of this kit! My boys love the shape cutters in this set. I love the miniature pail and shovel in this set. We use it all the time with Kinetic Sand, cloud dough, and playdough. What a great selection of animal cookie cutters! 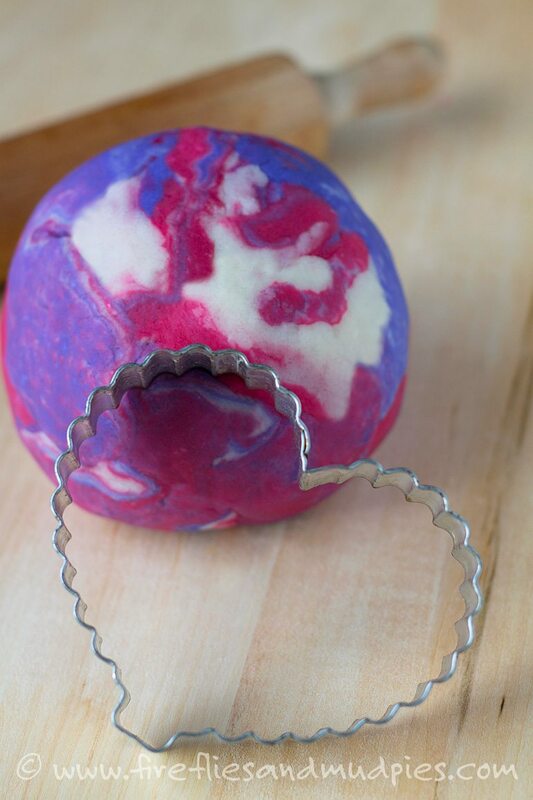 Great for baking and playdough. 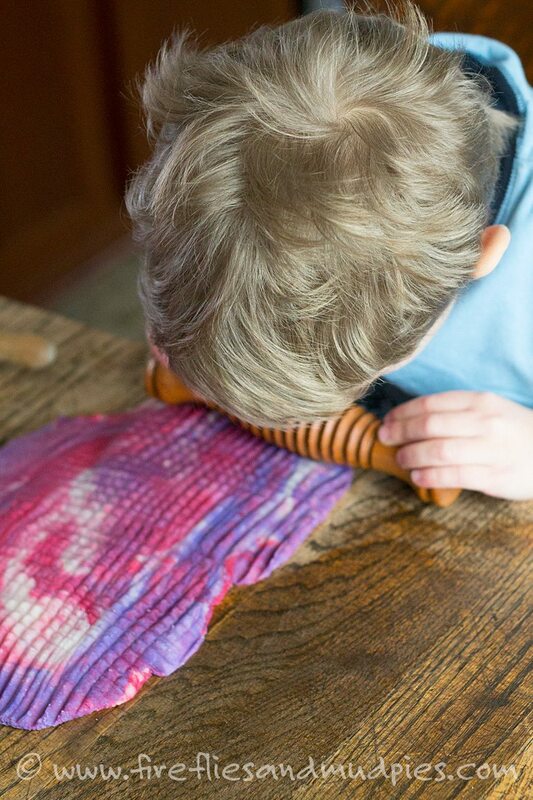 Perfect for little hands, these rolling pins are also fun to give as a gift with homemade playdough!